I Want To ‘Go With Oh’ to Berlin! Some of the fondest memories of our RTW trip are the five days we spent in an apartment in Berlin. I was already head-over-heels in love with Germany – its cleanliness and orderliness, its undeniable history and steadfast resolve to overcome it, its attention to detail, and its beer….oh, the beer!! Staying in an apartment, in a regular neighbourhood made our time there even better. We walked to the grocery store, stopping in to The Little Pub along the way. Yes, it was really called that, and it really was little; with maybe a dozen stools, the same bartender every evening and a rotating cast of characters holding court. We did our laundry at the waschsalon, that had small cafe/bar in the front so we could have a beer while our clothes tumbled. We took the U-Bahn into the city to do our sightseeing during the day and returned at night to have dinner on the corner. It was perfect. How would you go about finding and apartment in Berlin? Go With Oh has hundreds of apartments and hotels to choose from all over the city. Our apartment was in Prenzlauer Berg but there are plenty of great neighbourhoods to explore. So what if I had the chance to go back? What would I see this time? The CurryWurst Museum. A whole museum dedicated to the ketchupy, curry-y sausage sensation! The Berliner Fernsehturm or TV Tower. The tallest tower in Germany offers some great views of the city – what a great overview to see how the city is growing and changing. The Bauhaus Museum. A chance to learn more about this modern design icon in a building that is worth the visit alone. It all from a bike. There are plenty of places to rent bikes in Berlin to take advantage of cruising through the nearby parks and maybe catch some weekend markets along the way. 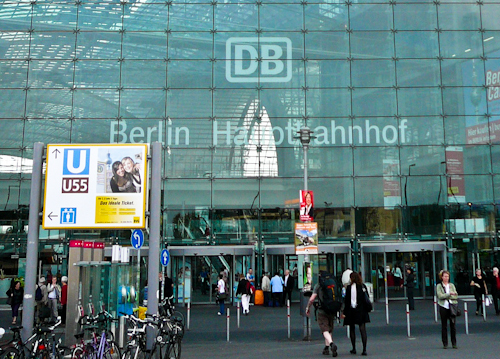 Take a free Berlin Walking Tour. I love walking tours and this one, from Alternative Berlin Tours looks quirky and interesting, taking us just off the beaten path and showing the other side of life in this cosmopolitan city. Berlin is one of those cities that I could see myself living in. Staying in an apartment while visiting lets me pretend I’m living there now. I haven’t been to Berlin, but looks like a fascinating city. I love that they have a currywurst museum. I LOVEE Berlin! Haha my German friend mentioned that CurryWurst Museum once and I thought he was joking! Michelle recently posted..Do you have travel smarts? Many thanks for taking part and we’re delighted you’re involved in this, the first of many ‘Go with Oh’ adventures!